Motoko Aizawa presents during a CSPF event on 'Sustainable Infrastructure' on 10 April. Credit: Bretton Woods Project. Notes from a Civil Society Policy Forum event on 10 April, which looked at sustainable infrastructure from fiscal, rights and climate lenses. Panelists discussed different definitions of 'quality' and 'sustainable' infrastructure, including those being developed by the G20 and the Inter-American Development Bank. The role of leveraging the private sector in infrastructure projects was also discussed in detail. CSO session sponsors: Christian Aid, Bretton Woods Project, ITUC, EURODAD, Urgewald, Debt Justice Norway, SID, LATINDADD. During its 2019 G20 presidency, QII is one of Japanese priority areas; why is this being picked up? There’s the geopolitical context – the quad, which includes the US, Australia, India and Japan – are working an agenda of ‘peace & prosperity’ in the Pacific, which is in competition to China. The quad is a very strong political driver for quality infrastructure in Japan’s G20. QII origin – this is not a new initiative: it started in 2014 with the Brisbane G20, where QII was discussed without really defining what it means. The concept has evolved in recent years, with key moments including the Financing for Development/Addis Ababa Action Agenda in 2015, the G7’s Ise-Shima Principles in 2016, and the G20 Leaders’ Summit in Argentina. APEC issued a revised Guidebook on Quality Infrastructure Development and Investment in 2018. There are also various reference points in Japan, including with JBIC and the QII Casebook. Overall, the content of what constitutes ‘quality’ in infrastructure depends on who is saying it. Openness – for enterprise, etc (project bidding not tied to national contractors; i.e. a direct response to China’s Belt and Road Initiative). There are also references to infrastructure for human development. These were actually developed for past G20 discussions of quality infrastructure. Now we are trying to see how we may be able to use these as part of the Japan G20 process. Overall, the normative framework of QII alone isn’t enough; we need monitoring of ‘sustainable’ or ‘quality infrastructure’, that allows for it to be regulated, and aligned with national and regional standards. However, the Japan G20 is already happening at the end of June, rather than later in the year, so the processes leading up to it are quite rushed. Beyond Japan’s G20 will follow Saudi Arabia and India presidencies. Also, the Global Infrastructure Hub has developed a new tool on inclusivity and social equity, which is a useful benchmark. Will the G7 processes ensure undergirding of QII? Overall, there are up to 30 ‘sustainable infrastructure’ processes; can these be standardised? In 2015, there were four ground-breaking international agreements that frame how we approach sustainable infrastructure: the Sendai Framework, Financing for Development (Addis Agenda), the Sustainable Development Goals, and the Paris Agreement. When we look at all four of those agreements, infrastructure is key. And 70 per cent of IDB’s work is in infrastructure, so if we can get that right, we’re aligned with those agreements in that part of our portfolio. There’s also an urgency from the point of view of climate change, in ensuring that our investments are not locked in to a high carbon future, and might become stranded assets. Defining ‘sustainable infrastructure’ – no one really knows what they are talking about, and that includes investors, who are saying “we also need to know.” IDB has been working on its own definition, which is part of a much larger trajectory of work on the concept of sustainable infrastructure, starting in the 1990s with World Bank early references, the IFC performance standards in 2006, and importantly for the current discussions in the G20 surrounding quality infrastructure, and the G7 Ise-Shima Principles in 2016. This includes ensuring infrastructure is aligned with countries’ national, regional and international commitments, including to the Paris Agreement. The approach attempts to address three overlapping challenges: reigniting global growth, helping countries achieve their Nationally Determined Contributions to the Paris Agreement (NDCs) and the SDGs, and addressing climate risks. Rights of end users: human rights are accounted for under the ‘social’ part of the framework, which stipulates the need to consult with project-affected communities. Last year, IDB produced a report on four decades of infrastructure conflict in transport projects in Latin America, which was very eye-opening, and revealed an overall lack of data and information of these types of issues. Lack of adequate planning, lack of transparency and lack of community engagement were important factors that had led to conflict in the cases outlined in the report. In terms of upstream planning for sustainable infrastructure, we’re looking at applying our approach across the whole lifecycle of the project. You need to link the concept of ‘sustainable infrastructure’ to the whole upstream and regulatory context, into investment strategies, national plans, etc. This is essential: if you really want to have ‘sustainable infrastructure’ outcomes you need to introduce it at the start, so that it informs the policy and institutional setting. Financing: There are different types of finance, that involve different types of leveraging of the private sector, and different roles for the state. A new IDB report, Moving forward together: Attributes and Framework for Sustainable Infrastructure, will be launched soon. 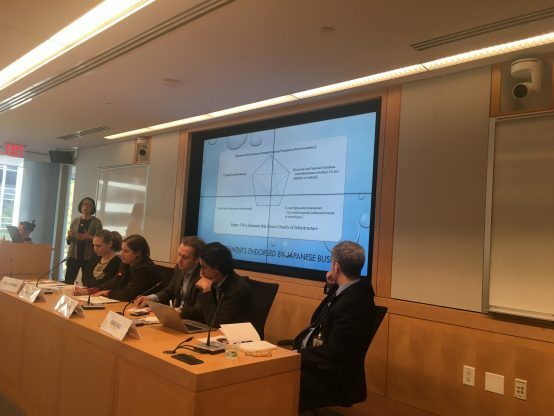 There was event at Brookings Institute on 9 April that included 4-5 MDBs, WRI, etc., and we’re trying to develop a more standardised approach to sustainable infrastructure, if possible. We recognise that other MDBs, especially the Asian Development Bank, are developing their own standards, and it’s really important to collaborate. Question from audience: Are you plugged in to G20? Amal-Lee Amin: Yes and no, we were involved under the Argentina presidency last year, but now with the Japan presidency in 2019 we are less involved. We are working with Harvard on a literature review of the concept of sustainable infrastructure. Every time you hear a talk on infrastructure in the G20 it sounds slightly different. The rationale for the World Bank’s PPPs push focuses on the so-called ‘infrastructure gap’, and the need to leverage the private sector to meet it. This includes the ‘Billions to Trillions’ approach to achieving the SDGs, which the World Bank has tried to operationalise through its Maximising Finance for Development (MFD) initiative. The World Bank has emphasised the use of public institutions to attract private finance, through different mechanisms. Nine pilot countries have been identified by the World Bank for MFD, with an emphasis on infrastructure investment. Eurodad has published a number of reports over the past few years that reflect the growing body of evidence on the risks associated with PPPs. The History RePPPeated report, published in October, looks at 10 case studies, both in developing and developed countries, which show that in these cases PPPs have resulted in very high costs for the public purse, with greater risks, and sometimes increased inequality and negative impacts for the poor. New Eurodad research has also found that PPP conditionalities are sometimes part of IMF loan programmes, as well as World Bank development policy loans (DPLs); in Egypt, Jordan & Iraq, DPLs included promotion of PPPs. My presentation will look at the first PPP that took place in Colombia after the change in PPP law in 2012; this is one of the case studies from Eurodad’s History RePPPeated report. This involved the Magdalena River, and was signed in September 2014 to develop the river and improve navigability for a 908 km stretch; $840 million was the estimated cost of the project. Navalena – a international consortium – won the contract. However, after the Odebrecht corruption scandal involving the government took place in 2015, Navalena declared the contract void. Communities had limited participation in all the main pre-project planning phases of the PPP. The project was incompatible with fishing, but this was overlooked as the main beneficiaries were coal and hydrocarbon industry. Nevertheless, the current government is looking to launch other PPPs on the Magdalena River, and to continue initial plans to improve navigability of the river, despite the voiding of the initial PPP contract. Thus, PPPs still represent a threat to fishing communities on the river, who remain excluded from the planning processes related to the river’s development. I am going to talk a little bit about the role of the private sector in development; when the Bank recommends PPPs to governments; and governance issues. Role of the private sector in development finance: If you look at the original “Billions to Trillions” paper, domestic resource mobilisation is the largest resource available to fund development, whereas MDBs put their money into funding service delivery. We always realise that public money is essential to funding development. But there is also the realisation that we need private finance. It doesn’t only equate to PPPs, or only to infrastructure. How can governments access different types of finance? In Egypt, the changes in PPP laws in the energy sector have been part of energy subsidy reform, that has replaced fossil fuel subsidies with targeted subsidies for the poor. In terms of PPPs, I think that we are very much on the same page around the need for transparency. If you look at the academic evidence, which isn’t huge, where PPPs do exist, they typically don’t affect the cost of services, or lead to negative impacts. What we’ve done over the last 4-5 years is to give governments the tools to say, “This is what you need to do if you decide to pursue PPPs.” It is not appropriate for all projects and sectors. That includes the PPPs Knowledge Lab. We have also launched P-FRAM, along with the IMF, which gauges how appropriate PPPs are in different contexts. We’ve been trying to collect data on how well countries are doing on their PPPs. This is part of trying to identify examples of best practice. Where countries are weak on governance of infrastructure, they are weak across the board. I was in a country in South America recently, and while they had scored poorly on PPP preparation, the publicly-funded projects were also in bad shape. Another challenge is that transparency declines as you go through the project cycle. Not just for PPPs, but for public services, we’re developing performance indicators. This should enable end users to gauge the quality of services. Work on the gendered aspects on PPPs is also forthcoming. Luiz Vieira, Bretton Woods Project: This is a question for Amal-Lee Amin – how do you evaluate the development outcomes of projects? Do you use a particular framework? Victor Bullen, USAID: Financing from private sector usually comes in a separate tranche from public side – there is a disconnect, in terms of the accountability process. How are you dealing with this issue? Disability CSO: I am not seeing much on how disability access is included in infrastructure, even though it is included in the SDGs. Am I missing something? Zimbabwe CSO: Do you have any data to show that you are having any success in helping the LICs to mobilise finance for infrastructure? How can these countries move forward? Motoko Aizawa: On the sequencing of (public & private) Environmental and Social Impact Assessments (ESIAs): we all struggle with that. I think that it happens better in larger projects, where there are resources in place, but in smaller ones it is very difficult. There should be an attempt to have facilities in place so that ESIAs can be done effectively. On disability and where it sits within sustainable infrastructure – I think it fits in the inclusivity part, including urban design. I am afraid that the topic is not really getting sufficient attention when we see all the other things on the QII agenda. Cecilia Gondard: The risks of PPPs include that there can be off-balance sheet debt liabilities. That is why we are pushing for prior assessments that include fiscal risks, and account for inclusivity. Amal-Lee Amin: The sustainable infrastructure framework is something that we are trying to roll out in our operations, but it is not yet incorporated into IDB’s development impact framework – we’re looking at how to do that this year. It’s comparable to other MDBs’ development outcome frameworks. For PPPs, we’re trying to help governments get the best deal they can, if they decide to go that route. On inclusivity, we are working to include disability access as part of the social aspect of upstream infrastructure planning. Luiz Vieira: How comprehensive is your development impact framework, in terms of gauging its wider development impact? Amal-Lee Amin: This is not about safeguards, its about delivering on Sendai and the SDGs. When we look at projects, whether they are publicly or privately financed, we need to ensure that they are working in the public good. This involves more intent, and planning. David Cruz: The initial contract is important for getting the company and the government on the same page. This is where the involvement of local communities is also important. Amal-Lee Amin: Private companies are increasingly seeing a huge risk if there isn’t sufficient consultation with local communities. So this is something that they are looking for governments and MDBs to have undertaken. Clive Harris: Just building on Amal’s point there, we’re seeing private sector say that “this will hit our bottom line.” This stuff has been around long enough that we can now spot the pitfalls. These days, a lot of PPPs are on the balance sheet. Brazilian academic: For any policy to be successful, the ethics have to be right. Ethics goes beyond environmental and social frameworks. How are you dealing with this issue. Barry Herman, The New School: the World Bank has been trying to bring private finance into public projects since 1945; what gives MFD a greater chance of success? Jon Sward, Bretton Woods Project: This is a question mainly for Amal-Lee: Do you think we have the right financial instruments in place for countries to fund their low-carbon transitions, linked to the question earlier about finance for LICs? Or do you think we need to create ‘transition facilities’, that can provide more concessional and grant-based financing to support countries’ low-carbon transitions? CSO from NewClimate Economy: Already the carbon footprint of infrastructure is too large. Quality infrastructure needs to address this issue. Do you see Japan agreeing a set of quality infrastructure principles under its G20 presidency? Motoko Aizawa: I think Japan will do something on QII. On climate, Japan has been a non-performer. Why not use SDGs to build in ethics, as it’s already in there? I would love to see QII actually enter the conversation through sustainable development, but I don’t think this will happen. Amal-Lee Amin: On the question of finance – yes, we do need more concessional or grant financing to get below 2 degrees (as mandated by the Paris Agreement). Clive Harris: Just to respond to the question of “Why do we still try to do this?” Although development finance is mostly public sector, there are important areas where the private sector can be involved, and we’re trying to help governments navigate that.